Jane the Virgin is probably the weirdest show concept I've seen in recent years, and yes, I am including Sleepy Hollow in that list. It's an hour long drama done in the style of a telenovela parody, featuring a predominantly Hispanic cast, about a young woman who is accidentally inseminated with her boss' sperm and then has to decide what to do about her surprise pregnancy. And that is probably the most plausible thing to happen in the pilot. What I'm getting at is that this show is a whole big bag of crazy. Not only is the plot, well, telenovela worthy, the show is populated entirely by unknown actors, huge chunks of the dialogue are in Spanish (with subtitles), and there's this all knowing voiceover that likes to make jokes at our heroine's expense. And you know what? It's great. I love it. It's so great. As with most shows that have a slightly unusual background or premise, Jane the Virgin is all about the execution. If anything about this production were just slightly worse, the whole thing would fall apart. 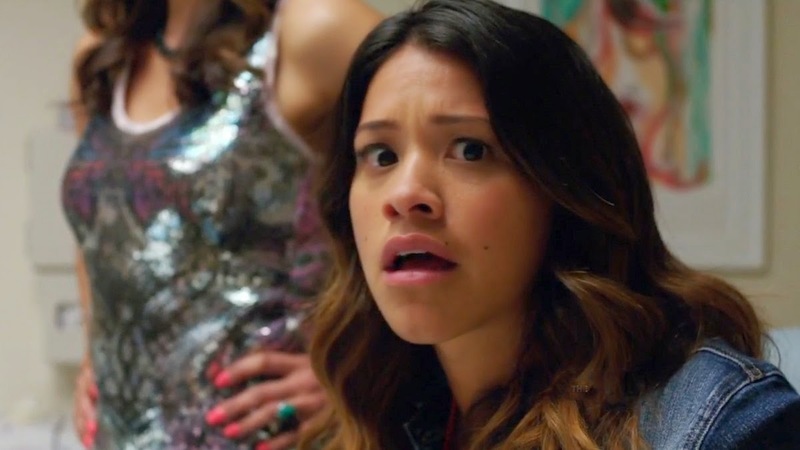 If Gina Rodriquez weren't such a good actress, or if the writing weren't so dang funny and charming, or of the whole show weren't so freaking cute, well, you get the point. It works because all those little pieces have joined together to make a really wonderful piece of television. There's even a scene where the doctor is trying to take down a (white) patient's information, and keeps asking her to spell her (very white) name again and again. The joke of course being that in this world, white people are the anomaly. And that's great. The pilot episode races us into the premise of the show without making a lot of pretense about trying to set up a realistic world first, which is frankly helpful. I mean, the premise here is so utterly ridiculous that if it were to be established that this is a realistic, normal world, then it would be hard to believe, frankly. Anyway, the show starts out by establishing a couple of things. First, that Jane Villanueva (Gina Rodriguez) is a virgin. The product of a teen pregnancy, Jane grew up living with her mother and grandmother, and has had it drilled into her head since a young age that her "flower" is very important and should be saved for someone special. So even though she's been dating the same guy, Michael (Brett Dier) for two years, she's still a virgin. Second, Jane is a very determined, kind, loving person. She's working as a waitress while she puts herself through college to get her teaching degree. She has a plan, and she's going to stick to it, even if her waitressing job at a hotel in South Beach, Miami occasionally forces her to put on a mermaid costume and pour drinks from the pool. Jane's life takes a rapid turn for the ridiculous when she turns up for her gynecology appointment after a late night at work only to find her regular gynecologist out sick and the replacement, Dr. Luisa Alver (Yara Martinez), a crying wreck. See, Dr. Alver, whose brother, Rafael Solano (Justin Baldoni) owns the hotel where Jane works, found out her wife was cheating on her the night before. And now Dr. Alver has to come to work and cover twice the normal number of patients. So she's not really at her best. The big mistake is deceptively simple. Dr. Alver has two patients, one in room seven and one in room eight. One of them is Jane, in there for a regular pap smear. And one of them is Petra Solano (Yael Grobglas), in there so that she can be artificially inseminated with a sample of her husband's sperm in order to save her failing marriage. Her marriage to, I hope you're following this, Rafael Solano. Good? Good. Well, Dr. Alver gets the room numbers mixed up, and before Jane is even really aware what's happening, she's been inseminated and sent on her way. Dr. Alver realizes her mistake as soon as she goes into the other room and finds Petra there, but it's too late. Two weeks later, Petra is definitely not pregnant, and Jane definitely is, much to her own horror and the horror of her super religious grandmother, Alba (Ivonne Coll). Her mother, Xiomara (Andrea Navedo) is more blase about the whole thing, though she does have a moment of panic where she thinks her daughter has immaculately conceived and is some kind of religious messiah. It only takes a few phone calls to find out from Dr. Alver what happened. Jane is pregnant, with her boss' baby, and she has no idea what to do. The whole plot sort of spins out from there with soap operatic (telenovela) tendencies. Jane really doesn't want kids right now, but she's also very devout and the idea of getting an abortion is uncomfortable to her. She seriously considers it, which is an honest and good moment, but she's not sure she can go through with it. Her boyfriend, Michael, doesn't want her to keep it either, and because this is a ridiculous dramatic show, he proposes to her just as she's telling him about the baby. Meanwhile, Petra and Rafael are furious about the mistake, because that was the only sample of Rafael's sperm that exists. Turns out that a few years ago he had cancer, and now he can't have kids. That was their only shot. Also, Petra is cheating on Rafael with his best friend and trying to wait out their pre-nuptial agreement so that she can get ten million dollars in the divorce. And Rafael really wants to divorce her but also wants Jane to give him custody of the child, which she isn't apt to do if he's in a divorce. Also there's this whole thing where Jane and Rafael kissed five years ago and are so obviously soulmates but they're both in other relationships and also deeply in denial. And Jane's father starts showing up around this time too. He was her mother's high school boyfriend, and he was a loser back then, but now he's got his act together and he's a telenovela star. Jane knows nothing of this. So yeah, there's a lot going on in this show. I haven't even managed to get through all of the plotlines introduced in just the first episode alone, and the show will only get bigger from here. But that's not a criticism, it's a compliment. The reason Jane the Virgin works is because they recognized that the basic premise of the show was completely ridiculous. And instead of being ashamed of that ridiculousness or trying to mask it or make it more legitimate, they just leaned into the crazy. It's like they looked at the script and figured that they could try to go legit and just make it all serious and angsty and intense, or they could fling their hands in the air and yell, "Hell yes this is a telenovela! Now strap in and shut up!" They did the latter, and I am so glad they did. I've talked about this a lot, but it bears mentioning again. Asking for diversity in the media is a lot more than just asking that shows or movies or books have a diverse cast. It's about more than just seeing lots of different kinds of people telling the same stories. There's also a level of cultural diversity that's important too. While I'll be the first to admit that I know just about nothing about telenovela culture, I do know that it's very important globally, and that it's a big part of Hispanic culture. Jane the Virgin is actually based on a telenovela, just like the obvious comparison, Ugly Betty, was. In adapting it for American television, the show obviously had an option to make the show over and Americanize it. What I really respect is that it didn't. It kept very close to its telenovela roots, and in so doing, made a project that's honestly just lovely to watch. It doesn't feel like anything else on network television. It's different. It's new. Don't we want that? More than that, the show makes no beef about being firmly rooted in Hispanic-American culture. Alba, Jane's grandmother, speaks almost entirely in Spanish. Jane and Alba are both deeply religious, in a way that could easily feel stereotypical, but ends up feeling incredibly real. Xiomara is the stereotype of the oversexed young mom, but she doesn't feel cheap or easy. She's been humanized and contextualized within her culture, and she comes off as one of the most sympathetic characters. She's an aspiring singer and performer, and her bids at stardom don't feel desperate, they feel honest. All of it feels honest. Basically, I think you should watch Jane the Virgin. It's seriously great. Funny, heartwarming, a little bit cheesy, and really unexpected. Totally worth your time. *Technically speaking, Yael Grobglas who plays Petra is Israeli, not Hispanic. But I'm reasonably sure that her character is meant to be Hispanic.